Last nights non-match. No score in the entire game from either team, but that's all Kuwait needed to do in order to get into the AFC. Oman didn't make it, and are subsequently out of the AFC to be held in Qatar. Commiserations, and better luck next time boyo's. There's a lot of stuff coming up in the next few weeks. 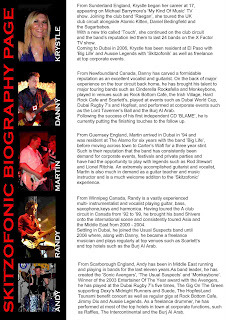 Next Wednesday night (10th March) Dubai band Skitzofonik will be playing at the Muscat Rugby Club at 8pm. This band really is good, and comprises of the three from Acoustofonik, who have previously played at the club to a packed capacity crowd. This time they're back, and they're bringing 2 more people with them. Tickets are RO 5 for members and RO 8 for non-members. 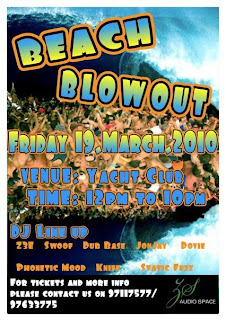 Then, for those that like to relax on Fridays, there is another one of those all-day beach parties being held at the yacht club. The last one ran-on till early morning, but this one will stop at 10pm, which being on a Friday is probably a good idea. Should be a good place to chill out, so if you're at a loose end on Friday the 19th, why not check it out? The beach party might be just the cure for those that will be attending the Irish ball the night before. Yes, it's nearly that time of year again - pretend your Irish and dye your drinks green! 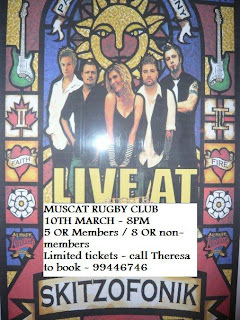 St Patricks day is on March 17, and there is a ball being held here in Muscat - more details on that to come. All in all, a pretty big month on the social calendar. Bad luck again to the Oman football team. Woops! Quite right!! :)I knew something was odd when I was writing it... But there's a big "ball" event being held on the 18th... not by the Irish society, who are also holding a ball, presumably on the 17th. How many balls are there next weekend? There's the Green Sapphire charity ball on the 18th, there's the Dutch Oranje ball on the same night, and there's a Sultan's School alumni dinner/ball also on the 18th..
Great tips...the Stampede was wild. Where is the contact info for the Irish Society..seems there is none on google. The ISO St Patricks Ball is being held on the 18th (because that is the most popular weekend night), at the Shangri La hotel. Last I heard it was a sell out. we've been for the last 3 years and it is a fab night....deffo one of the better balls!